In this four-week introductory course we will use a journal as a place for experimenting with different themes and mixed media techniques, combining image making with journal writing. Together we will playfully explore meaning-making through writing, painting, collage, doodling and more. Each class starts with a warm-up exercise and technique tutorial to break the blank page and give you some inspiration for the theme of each class. 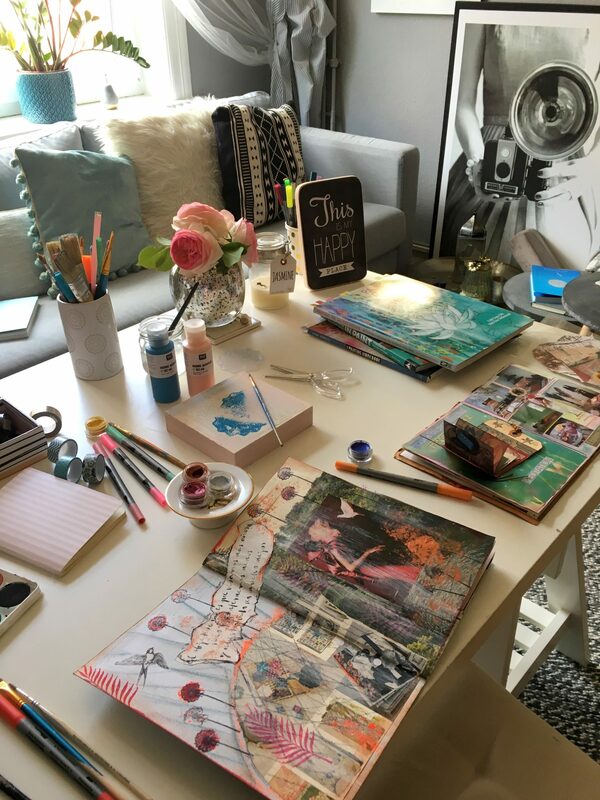 You will have the opportunity to personalize your journal art by working with your own photos, favorite poems and mantras. At the end of each class you will have the chance to reflect on the finished pages through writing. I will guide you through the elements of art to help you to confidently discover your own creative voice. You will start by learning a few fun and simple mixed-media background techniques to break the blank page and create a base for whatever you want to add on top. You will play with collage, paint, stencils, rubber stamping and writing to cover the first pages of your journal. I will talk you through the principles of color theory and composition. Using an original photograph (or a photo copy of it) as your focal point you will explore the notion of memory and story-telling with personal imagery in your art journal. This is a wonderful opportunity to “re-write” a story from the past in a safe way or to simply work with photographs in a new and creative way. I will demonstrate two different photo altering and transferring techniques to get you started on your visual narrative. After a relaxing guided meditation, I will walk you through some abstract painting and intuitive “mark-making” exercises to help you tap into your subconscious “inner landscape”. Soft, meditative music will assist you to dive into a state of playful flow and create from a present-moment awareness – without the expectation to produce a specific image. Just allow the colors and shapes to choose you and surrender to the intuitive process. Reflecting on your favorite quote, poem or personal mantra (alternatively pick one from my collection of magical words) you will create a page spread around your chosen text, using your favorite mixed media techniques to make a visual statement and draw out emotion. I will show you different ways how to add texts and words with rubber stamps, stencils, hand lettering and collage.